It is Graffiti Summer in Modesto and so I thought I would listen to a music that owes a debt to it’s origins right here in Modesto. 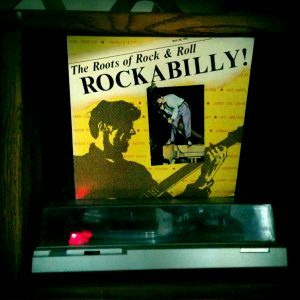 Rockabilly and the sounds of the Maddox Brothers and Rose who influence can be heard on all the recordings on this particular release. 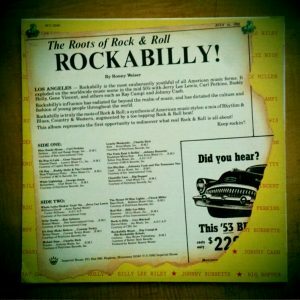 This is one of the first compilations I bought that helped give me a foundation in Rockabilly Music. Giving me an opportunity to rediscover what “real” Rock & Roll was all about. 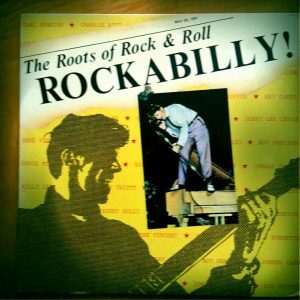 It is 16 tracks of classic Rockabilly. The bands and the music that inspired the Stray Cats, Reverend Horton Heat, Koffin Kats adn all the Neo Rockabilly and Psychobilly Bands. Every song is a hit from the lead off track “Blue Suede Shoes” as performed by Carl Perkins to the closing track on side Two “Rockabilly Music” by Ray Campi and His Rockabilly Rebels. Blending a mix of Rhythm & Blues, Country & Western augmented with the toe tapping Rock Beat and the distinct sound of the Slap Bass. I had heard many if not all on the oldies Rock stations, Roy Orbison, Gene Vincent, Buddy Holly & the Crickets, Johnny Cash & the Teenage Two; along side with acts that would become Country legends George Jones, Charlie Rich and Conway Twitty. These songs past the test of time. It is so much fun to see the classic cars crusin’ Modesto while listening to the original sounds of Rock and Roll.